How can you prevent cold hands from ruining a winter hike? Or impeding your ability to grasp your hiking poles on a cold, rainy trail in spring or fall conditions? Use these best hiking tips to keep your hands warm, that's how! Let's use every possible way to prevent cold hands, starting with how you prepare for your hike. 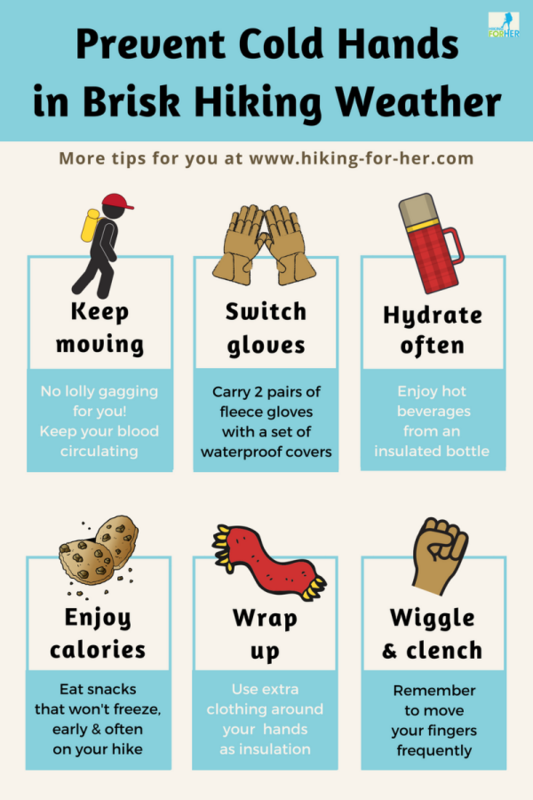 If you're a beginner hiker, you might not know how important it is to do a few simple things to guarantee warm hands throughout your hike as you're pulling together your gear and hiking food. The day before your hike, set up a system to make sure you are ingesting plenty of water. You want lots of fluids circulating in your blood vessels, distributing your warmth. Set an alarm on your phone to drink every hour on the hour. Line up 8 pennies on your desk, and remove one each time you drink water. And let's be clear: that's just water, as in that clear stuff coming out of the tap. Carbonated beverages, coffee, sugary sports drinks, beer, wine - those don't count, and may work against your hydration status by interfering with your water balance and thirst mechanisms. If cold or room temperature water sounds unpleasant to you, then drink warm, flavorful herbal teas. The morning of your hike, brew up this tea and bring some along in a double walled insulated bottle, like this one. If you're wildly interested in more choices for the best tea for hikers, I've got you covered right here. Ditto for hiking hydration strategies. Don't be that "shoulda" hiker who proclaims loudly that she should have brought gloves, should have worn better socks, should have -whatever-. Hiking deserves a thoughtful planning process, even if it's "only" a short day hike in familiar terrain. Treat yourself with the respect you deserve by including the right layers in your hiking clothing. I know you've already thought about gloves, but did you think about bringing a back up pair to prevent cold hands? Gloves get soaked from your perspiration. They fall into the snow and fill up with coldness. Or they're accidentally left behind after a rest stop. By carrying a second pair (I call it my insurance pair), you've got yourself quite literally covered. Midweight fleece gloves, protected by waterproof covers in really bad weather, are the way to go. To read more about serious glove choices, go here. And read my possum wool glove review, too. There's another, less obvious advantage to wearing gloves. You can take them off to regulate your body temperature. It's smart to avoid sweaty hands, which cool down quickly if you stop moving. After working hard for several hours, or when conditions are calm and sunny and your hands feel fine, stow your gloves in your pack to keep from overheating. What, no gloves?? 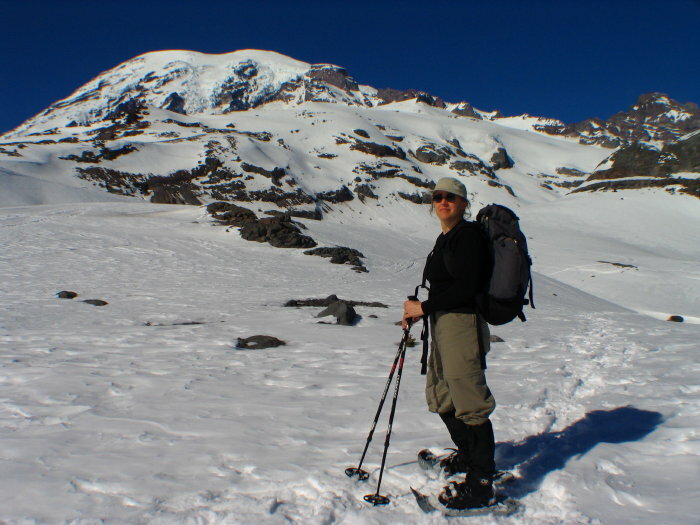 To avoid overheating, take them off when you're working hard to achieve a hiking objective like Mazama Ridge at Mount Rainier National Park. Hands are the obvious focus of preventing cold hands on a hike, but let's also cover up large areas where heat loss works against you. Your choice of hats should go way beyond fashion when you venture into cold, wet and windy conditions. A decent winter hat stays put, covers your ears, and fends off moisture while avoiding the "boiled head" syndrome. This hat ticks all the boxes! Read more Hiking For Her tips on the best hiking hats. When conditions improve, you can switch to a headband to protect your ears while giving you more head and neck mobility. A fleece neck gaiter is a priceless piece of hiking clothing when the wind kicks up and your hat just isn't enough to keep your head warm. Warm hands while hiking isn't just about your hands. It's about keeping your blood freely circulating from your core into your extremities. Avoid tight, constricting clothing at your neck, wrists, waist, groin and feet. Don't take long rest breaks - getting cooled down with a lower heart rate can work against your plan to prevent cold hands. To assist your heart in keeping your hot blood pumping, stay hydrated. That means drinking when you don't feel thirsty and using water bottles instead of a freezing prone hydration tubing system. Please resist the urge (sorry) to skip drinking frequently, in a futile attempt to avoid peeing in cold conditions. Tip: Be strategic about urinating in icy cold weather by using a "stand up and pee" device like this one. It's easy to get distracted by the scenery, your pounding heart as you chip away at gaining elevation, and your craving for a big mug of hot chocolate. Make it a regular habit to check in with your body, particularly your hands. Wiggle your fingers frequently, especially if you are gripping poles. Clench and unclench your fists at least every 15 minutes. As soon as you feel - or rather, don't feel - that your hands are warm enough, take action. Waiting only digs a deep hole that you might not get out of easily. Put down your poles, camera case, or whatever else you might be carrying. Swing your arms in big, lazy circles over your head, allowing blood flow to increase to your fingers. Stomp your feet, to return blood back to your heart for distribution to your fingers. Eat a calorie dense snack. Switch out your gloves if they're at all damp. If you're taking a rest break, get going again. You need the extra heat from skeletal muscle contractions. If your fingers are losing sensation quickly, locate a sheltered position out of the wind or direct precipitation. Unzip and loosen your layers of clothing so you can insert your right fist into your left armpit. You know what to do with your left fist, right? Have your trail buddy cover up your torso as much as possible, adding an extra layer from your Ten Essentials. A thick fleece scarf can also act an an impromptu blanket. Hop around a bit as you're warming up your hands. Monty Python skits might come to mind, and that's ok - laughing will also increase your circulation! To absolutely ensure that your hands will stay warm during your cold weather hike, take matters into your own, um, hands with hand warmers you can activate when needed. Sometimes chronically cold hands indicate a medical problem, such as Raynaud's disease. Warning signs include digits that turn white, fingers and toes which are persistently cold at times regardless of external temperature, and peripheral neuropathy (tingles, lack of sensation). Mayo Clinic provides a photo here. The serenity of winter trails: just one of many reasons to get out there with warm hands! 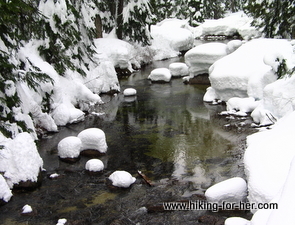 Start warm, stay warm, and enjoy the chance to warm up to the idea of cold weather hiking. 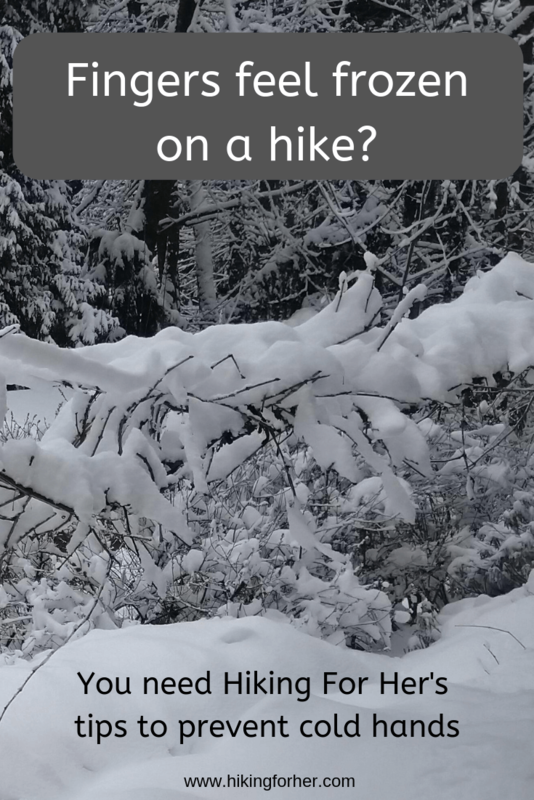 If your first few brisk hikes go well, and you prevent cold fingers by using these tips, I predict you will fall in love with cold weather hiking. You're going to need a few more tips and tricks, though. 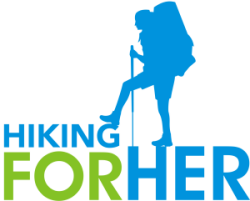 Rest assured, Hiking For Her recommends only the gear and tips known to work on countless hikes in all sorts of weather conditions and terrain. When you use HFH links to purchase your gear, you pay nothing extra - but a small percentage flows in to allow this free website to keep sharing the most trustworthy and very best hiking tips. Your support is warmly appreciated!